Big-wave surfers at the famous Mavericks in Northern California are not allowed to use personal watercraft as a safety measure unless the National Oceanic and Atmospheric Administration (NOAA) issues a high surf advisory. That ban of PWCs goes for Hollywood, too. The lights, camera and action of Hollywood recently descended upon Mavericks near Half Moon Bay, Calif., to shoot surfing action scenes for "Of Men and Mavericks," a surfing movie about the life of surfer Jay Moriarity, whose big-wave surfing exploits helped put Mavericks on the map. Last Thursday morning, a day before the shoot wrapped up, NOAA officials showed up at Mavericks to enforce the ban of PWCs in the Monterey Bay National Marine Sanctuary. The ban is said to protect the wildlife. According to Surfline.com, a NOAA official got on a loudspeaker and warned those on PWCs who were on their way out to work safety for the movie that they'd be ticketed "unless they went out [and] moored to a bigger boat and stayed in the channel." Ironically, in December, actor Gerard Butler was caught in a set of big waves. He was held down underwater for two waves before popping up and being pulled out of the punishing surf by a safety patrolman on a PWC. The actions likely saved Butler's life. On Thursday, NOAA wasn't in the business of helping to save lives. It issued three tickets to the PWC safety patrolman working on the movie. "Heated discussions" were involved. Surfline.com reported that on Friday, the California Department of Fish and Game had a boat and helicopter tracking down PWC serial numbers. 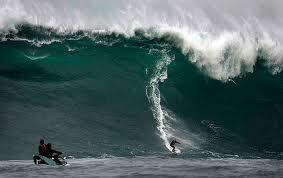 Said Surfer/stuntman Mark Healey, "They probably spent about $300,000 of our tax dollars to get a few skis at Mavs." 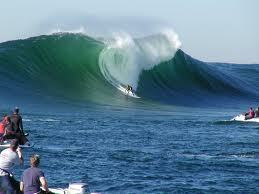 Turns out, the movie producers on "Of Men and Mavericks" got the shot they wanted on Thursday. Apparently, they were shooting for a similar wave -- one famously caught on video -- that wiped out Moriarty and made he and Mavericks famous. Thursday's swell - while chunkier than Tuesday's -- was a perfect opportunity to nail some serious footage. A dozen Pearson Arrow guns, colored the same as Jay's famous Surfer mag cover wipeout, were sprinkled throughout the lineup. Guys like Anthony Tashnick, Greg Long, Twiggy, Ryan Augenstein, Kenny Collins, Travis Payne and more were all vying for the Iron Cross money shot. A helicopter with a crazy, $250,000-camera circled just above. Mark Healey had a shocker at Jaws and flew over to Mav's for Thursday morning. "It's completely ironic," he laughed. "Greg Long is an actor playing Jeff Clark - and I'm doing Greg's stunts 'cause Clark's a goofyfoot! So funny." Healey, a part-time stuntman by trade, is no stranger to big Hollywood productions. He was hired on to, well, eat [expletive] as Jeff Clark. "I had to try get smoked," he said. "So I was taking a lot of chances. I figured eventually my number would come up. It did. They got the shot." Incidentally, "Of Men and Mavericks" is scheduled to be released Oct. 26, 2012.